Europe is shaping a moon-first program of human exploration beyond low-Earth orbit. There is growing interest in Europe to prioritize the moon as humanity's next deep-space destination. Europe's lunar intentions were clearly evident at an international symposium this month to discuss plans for a return to the moon. The European Space Agency (ESA) hosted the two-day symposium, called "Moon 2020-2030 – A New Era of Coordinated Human and Robotic Exploration," on Dec. 15 at the European Space Research and Technology Center in Noordwijk, Netherlands. More than 200 scientists and space officials from 28 countries attended the meeting. Creating an international pathway to the moon is being blueprinted by the European Space Agency. The message would entail "how lunar exploration can be implemented as a sustainable international endeavor, building on past successes and enabled by new partnerships," Landgraf told Space.com. ESA already participates in the critical effort to develop human space-transportation systems for missions beyond low-Earth orbit. The space agency is providing the European Service Module to be used in conjunction with NASA's next spaceship: the Orion crew module. Furthermore, the head of ESA, Wörner, has repeatedly expressed his keenness for a moon base as a successor to the International Space Station. He has stated that such a lunar base should be international, drawing upon different competencies in various countries. "This conference seemed to accept that it was a new way of doing exploration," Lester told Space.com. One strong recommendation that will come out of the meeting is that real analog studies will be necessary to understand how to do operations on the moon, he added. "Not analog operations at a moonlike sites, which can be hugely expensive just for travel, but analog operations where geologists use a real rover robot, perhaps just in a rock yard, with vision, dexterity/haptics and low latency control to do real-time field geology," Lester said. The European Space Agency's director general, Johann-Dietrich Wörner, has expressed his desire for a potential farside moon station. NASA's Kathy Laurini, co-chair for the Exploration Roadmap Working Group for the Global Exploration Roadmap, also took part in the European gathering on lunar exploration. 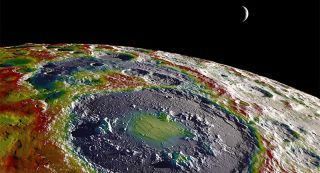 "The symposium was very well-attended and effective in gathering community input on priorities for exploration of the moon," Laurini told Space.com. A major topic at the meeting, she said, was how humans in cislunar space - the region of space near the moon - could contribute to lunar exploration. They could do so by working with robotic assets that demonstrated future human landing technologies and contributed information about high-priority science questions. "The ESA space-exploration strategy sets the moon as a priority destination for humans on the way to Mars, and the recent talk of a 'Moon Village' certainly has generated a lot of positive energy in Europe … [of] Europe playing a role in a global human exploration scenario," Laurini said. It is clear, she added, that the ESA Ministerial meeting in December 2016 will be an important milestone for Europe. "The timing is right," Laurini said, "to get started on the capabilities which allow Europe to meet its exploration objectives and ensure Europe remains a strong partner as humans begin to explore the solar system." Europe is sharpening its skills in developing human space-transportation systems for missions beyond low-Earth orbit. An example is the European Service Module, to be used in conjunction with the NASA-developed Orion crew module. Laurini took part in a panel discussion during the meeting, describing NASA's journey-to-Mars vision, noting the agency's "desire to lead an international effort to explore deep space with the 'proving ground' of cislunar space as the first step." All the strategic planning and scenarios done over the last several years, Laurini said, show the importance of human missions into cislunar space as the initial common step beyond low-Earth orbit to destinations such as the moon and Mars. "Human missions to the moon will only be possible with European investment in related technologies and capabilities,"Laurini said. Also bullish on the European meeting and a U.S. meeting organizer is Clive Neal, professor at the University of Notre Dame in Indiana. He said that take-home messages from the meeting were numerous. "We keep talking about lunar resources, but we still need to demonstrate they can be used … [that] they are, in fact, reserves. So ground truth verification of deposit size, composition, form and homogeneity requires a coordinated prospecting program. A successful program would then clearly demonstrate that lunar resources can enable solar system exploration," Neal said. The meeting highlighted technology development in terms of precision landing; robotic sample return; and cryogenic sampling, caching, return and curation, Neal said. "Significant investments in the latter are required and starting to be made," he said. Quantifying the benefits from government investment in space exploration is critical for convincing both governments and the private sector to invest in such endeavors, Neal said. In other meeting news, Neal said, it was evident that partnerships — especially those between ESA and Russia — are maturing rapidly. "There is most definitely international interest in human missions to the moon," said Paul Spudis, of the Lunar and Planetary Institute in Houston. Spudis told Space.com there is recent and significant focus on the moon, not only by Europe, but also India, Japan and China, "whose lunar plans are probably the most ambitious of all, if not the most transparent." A single-nation effort, analogous to NASA's Apollo moon-landing project. China is the most likely initiator of this path. A cooperative, international effort, analogous to the International Space Station. ESA, Japan, India and Russia are likely major participants in such an effort. A series of commercial lunar missions, largely led by American "New Space" companies, an effort that would likely be almost totally robotic and fairly small in scope. "I do not rule out the possibility of a major change in the strategic direction of civil space in the USA," Spudis said, "but only after we have a new administration in place, and dependent upon who the new president might be. In such a case, our involvement would likely be along path No. 2." Spudis said he supports all efforts to return to the moon under most circumstances, "except one by China in order to establish their cislunar hegemony." Leonard David has been reporting on the space industry for more than five decades. He is former director of research for the National Commission on Space and is co-author of Buzz Aldrin's 2013 book "Mission to Mars – My Vision for Space Exploration" published by National Geographic with a new updated paperback version released in May 2015. Follow us @Spacedotcom, Facebook and Google+. Original article on Space.com.